"The Bracero History Archive collects and makes available the oral histories and artifacts pertaining to the Bracero program, a guest worker initiative that spanned the years 1942-1964. Millions of Mexican agricultural workers crossed the border under the program to work in more than half of the states in America." Can Indians Become American Citizens? Bhagat Singh Thind (1892-1967), who was born in Punjab, migrated to the United States in 1913. He attended University of California at Berkeley, and eventually earned a Ph.D. He also served in the U.S. Army during World War I and applied for U.S. citizenship in 1920. Despite a Civil War era law that allowed aliens who had served in the U.S. military to become naturalized citizens, he was turned down. " "Since 1973, the Ellis Island Oral History project has been dedicated to preserving the first-hand recollections of immigrants who passed through the Ellis Island immigration station between 1892 and 1954 and the employees who worked there. Over the years, the project has grown to include approximately 1900 interviews. The interviews include people from dozens of countries, former Immigration and Public Health Service employees, military personnel stationed at Ellis Island and the Statue of Liberty as well as people detained at Ellis Island during World War II until it closed in 1954." "William Williams (1862-1947) collected these photographs while he was Commissioner of Immigration for the Port of New York at Ellis Island, 1902-5 and 1909-13"
"The First Days Project shares 345 stories of immigrants' first days in the United States." "One of the greatest challenges for immigration attorneys, advocates, and immigrants, is to find the immigration policy memoranda, and legal decisions which will affect the outcome of their cases. Here we provide information of particular interest to LGBTQ and HIV-positive foreign nationals and their representatives." "The Immigration History Research Center Archives (IHRCA, or IHRC Archives) is a renowned archives and library for the study of immigration, ethnicity, and race. We select sources documenting a broad range of immigrant and refugee experiences, and strive to connect history to today’s experiences. We work closely with our colleagues in the Immigration History Research Center, and we are part of the Migration and Social Services Collections in Archives & Special Collections (ASC) in the University of Minnesota Libraries." Each week of the syllabus lists primary, secondary and mutimedia resources regarding an immigration topic. Some materials are freely accessible online while others are books or magazine articles that may be accessible within the Trible Library or through Interlibrary Loan. "This digital collection of historical materials from Harvard's libraries, archives, and museums documents voluntary immigration to the United States from the signing of the Constitution to the start of the Great Depression." Most materials cover the 19th century. "By using The Curtis Family Letters, students explore the reasons for Irish emigration from Ireland and the impact that immigration had on the family. " "The John Novak Digital Interview Collection consists of interviews about immigration, migration, and the Civil Rights Movement. The interviewees, who range in age from 20 to 90, speak of their experiences moving to and within the United States." "This project is coordinated by the Midpeninsula Community Media Center, located in Palo Alto, CA. It is made possible with support from the Silicon Valley Community Foundation and its initiative on Immigrant Integration." "This initiative has gathered and digitized oral histories from organizations across the state. These existing materials have been coupled with newly created stories that best document the rich tradition of immigration to this state. This project weaves together these audio and video histories into a single space where these stories can be gathered, saved, and shared in an openly and freely accessible manner." Look at the "Student Resources" section for each exhibit to locate primary source materials. "A short documentary following the story of Norma Ureiro, a transgender immigrant who faced enormous struggles in her life, especially when trying to flee Mexico for the United States. Featuring Norma and two lawyers at Immigration Equality (http://www.immigrationequality.org/ ), a pro bono group that protects LGBTQ immigrants in court. " U.S. Supreme Court case as to whether or not Bhagat Singh Thind, an Indian, qualified as "white" in regards to becoming a U.S. Citizen. Provides information on immigrating to the U.S., becoming a citizen, laws, etc. "... is a compendium of tables that provides data on foreign nationals who, during a fiscal year, were granted lawful permanent residence (i.e., admitted as immigrants or became legal permanent residents), were admitted into the United States on a temporary basis (e.g., tourists, students, or workers), applied for asylum or refugee status, or were naturalized. The Yearbook also presents data on immigration enforcement actions, including alien apprehensions, removals, and returns." Primary Documents begin on page 560. Each of the eight chronological chapters contains a survey essay, an annotated bibliography, and 20 to 30 related public and private primary source documents, including manifestos, speeches, court cases, letters, memoirs, and much more. Conflicts in American History: A Documentary Encyclopedia by Each volume has a different editor. "Includes a narrative overview, biographies, primary sources, chronology, glossary, bibliography, and index"
Includes a Data and Documents section. Click the title link to see a list of available speeches. 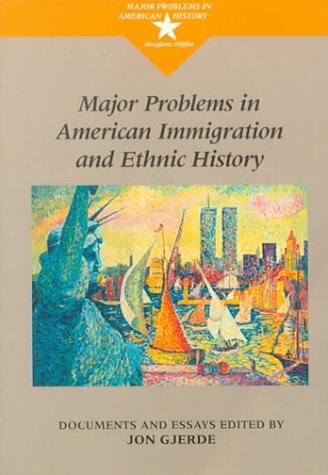 Immigration and Multiculturalism: Essential Primary Sources by K. Lee Lerner et al. 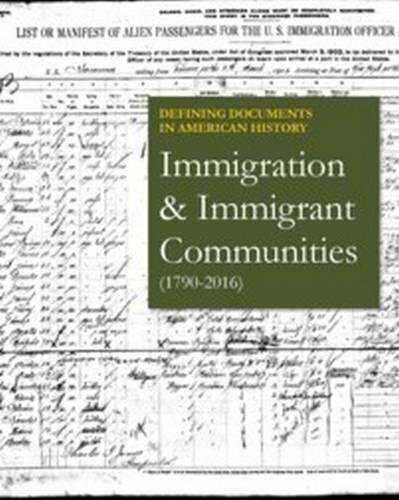 "Examines 12 key immigration issues from colonial times to the present through eighty-six pro and con primary documents and explanatory commentary." News from the Land of Freedom : German Immigrants Write Home by Walter D. Kamphoefner et.al. A compilation of magazine articles related to immigration.